Watch Hill is out of the way, off at the end of its peninsula jutting into the sea. That—and the difficulty of parking in the town—makes it a bit more time-consuming to reach, which is what keeps it quiet...and changeless. Most Amtrak trains on the run between New York City and Boston stop at Westerly, from which you can rent a car or take a taxi (expensive) to Watch Hill. 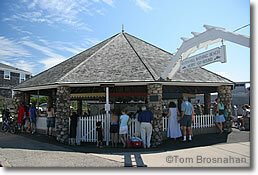 By car, go south from Westerly on US Route 1A to Avondale, then follow signs to Watch Hill (map).